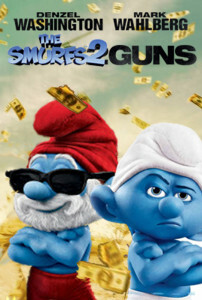 Denzel Washington takes over the role of Papa Smurf in this gritty sequel to the 2011 smash film. Papa has long suspected that Gargamel has been making his living through nefarious means and sets out to bring him down. Believing that Shooty Smurf from a neighboring village has been helping out Gargamel, he partners up with Shooty to infiltrate the dastardly fiend’s network. Meanwhile, Shooty Smurf, part of the NCIS (National Criminal Investigative Smurfs) has been looking into leaks in the Smurf Guard, protectors of all things Smurf. The trail has lead him to the doorstep of Papa Smurf himself, and he isn’t going to let one smurf’s smurfitude stand in his way. He’ll take down the biggest Smurf of them all if he has to. But both of them are wrong, and this is all a ploy by Gargamel and the CIA (Cats In Action) to turn the Smurfs on each other. Now, Papa and Shooty Smurf both look dirty. Can they wipe the slate clean before they get smurfed?